Alice Cooper (Vincent Damon Furnier) was born in 4 February 1948. He is the famous American singer, songwriter, musician and actor whose career spans five decades. 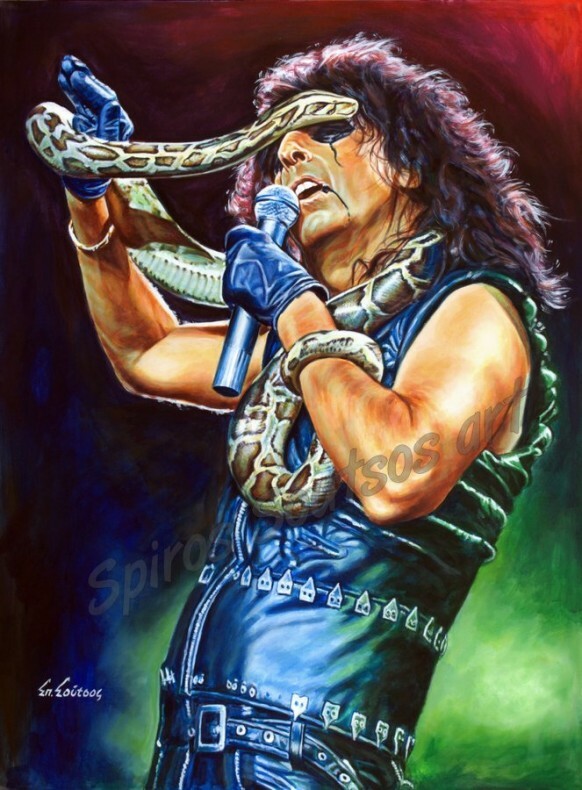 Cooper is considered to be “The Godfather of Shock Rock” due to his stage show that features guillotines, electric chairs, fake blood, boa constrictors, baby dolls, and dueling swords. He has drawn equally from horror movies, vaudeville, and garage rock to pioneer a macabre, theatrical brand of rock designed to shock people. Cooper is also known for his distinctive raspy voice. Originating in Phoenix in the late 1960s after he moved from Detroit, Alice Cooper was originally a band consisting of Furnier on vocals and harmonica, lead guitarist Glen Buxton, Michael Bruce on rhythm guitar, Dennis Dunaway on bass guitar, and drummer Neal Smith. The original Alice Cooper band broke into the international music mainstream with the 1971 hit “I’m Eighteen” from the album Love It to Death. Their next album Killer, released in 1971 and included further single success with “Under My Wheels”, “Be My Lover” and “Halo of Flies“. The summer of 1972, the single “School’s Out” went Top 10 in the USA and to number 1 in the UK. The album School’s Out reached No. 2 on the US charts and sold over a million copies. The band reached their commercial peak with the album Billion Dollar Babies, released in 1973 and reaching No. 1 in both the US and UK. “Elected“, a Top 10 UK hit from the album, was followed by two more hits”Hello Hooray” and “No More Mr. Nice Guy“. Furnier adopted the band’s name as his own name in the 1970s and began a solo career with the 1975 Welcome to My Nightmare, an album that was based on the nightmare of a child named Steven, featuring narration by classic horror movie film star Vincent Price. In 1988, Cooper signed with Epic Records. Then in 1989 his career finally experienced a legitimate revival with the Desmond Child produced album Trash, which spawned a hit single “Poison“, which reached No. 2 in the UK and No. 7 in the US. Cooper has experimented with a number of musical styles, including art rock, hard rock, heavy metal, new wave, pop rock, experimental rock and industrial rock.He is credited with helping to shape the sound and look of heavy metal, and has been described as the artist who “first introduced horror imagery to rock’n’roll, and whose stagecraft and showmanship have permanently transformed the genre”. Away from music, Cooper is a film actor, a golfing celebrity, a restaurateur, and, since 2004, a popular radio DJ with his classic rock show Nights with Alice Cooper.